It happened again, last night. I fell in love with myself. There was silence from children intently eating. This went over well. Better than a previous experiment with dumpling recipes. This is a keeper. In a small bowl, mix salt, pepper, tapioca flour, ginger, hoisin sauce, Vermouth, and shallot. In a larger bowl, add pork and cabbage. Add the flavorings. Mix thoroughly. 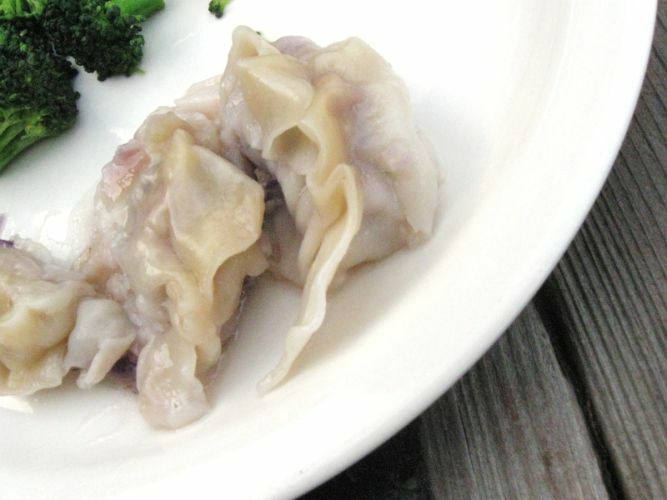 Using a tablespoon scoop, place the pretty colored pork mixture in the middle of a wanton wrapper. Wet half the edges with a wet finger. Press out the air and seal. Ready a pot of boiling water. Slowly add dumplings. Do not crowd. Depending on the heat of your water, cook on a low simmer 6-10 minutes. Test one. They will still be pink when done (the salt does this, I believe).